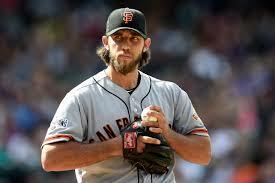 The last time Madison Bumgarner started a game at the Pit in AZ, he pitched well enough to win and hit two home runs, one off Zack Greinke. We all remember that as Opening Day, that magic moment about a million years ago before we knew what a disaster the 2017 season was going to be for the Giants. We remember how it ended, with blown saves first by Derek Law and then by Mark Melancon. If that feels like foreshadowing now, more than four months later, yeah, well, to me, too. It’s good sometimes that we can’t know the future. Don’t let Goldy hit a home run. Catch the damn ball in the outfield. Lock Josh Osich in a storage closet before the game and lose the key. Go ahead: spring for MLB.TV. It’s only $9.95 for the rest of the season. You know you want to. Yankees vs. Seattle: Mariners are now only a half game out of the second wild card; Yankees have a 2.5 game lead for the first wild card spot. KC at Cleveland: The Royals are probably not going to win that division, but they’re very much alive in the wild card race. Angels vs. Houston: The Angels are also right there in the wild card race, and who doesn’t want to see Mike Trout in the postseason? Marlins vs. San Diego: What I just said about Mike Trout? Same for Giancarlo (“Don’t Call Me Mike”) Stanton. Milwaukee at LAD: The Brewers are as close to the wild card as they are to the Cubs now. Sacramento has a doubleheader in El Paso after a rainout tonight. 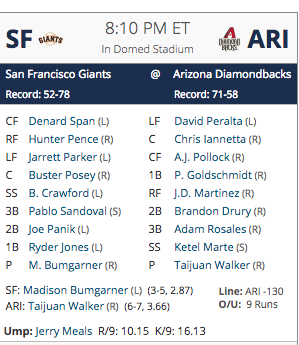 Not much to see in terms of the starting pitchers, but it will be interesting to see how Duggar, Shaw, and Mac (who’s been playing well) do. Richmond: Well, there’s…or maybe there’s…nah. Nothing to see here. San Jose: They’re the most interesting minor league team right now because they’re actually competing for a playoff spot (one game out in their division for the second-half lead), and there’s Reynolds and Howard and Quinn and the red-hot Jonah Arenado (.374 and 1.085 OPS in August) to keep track of. I’m sure you’re all as excited as I am to see the Giants rocking their special uniforms again tonight, especially those great socks. See you after the game.